1942. Country Joe McDonald born in El Monte, California. 2002. Eric Clapton, his 25 year-old girlfriend, Melia McEnery and a handful of close family friends are at the Church Of St. Mary Magdalen in Ripley, Surrey for the baptism of their 6 month-old daughter, Julie Rose and Clapton’s 16 year-old daughter, Ruth Patricia (the result of an affair in 1983 with her mother Yvonne Kellyn). After the baptisms are finished the vicar, The Reverend Christopher Elson, surprises the congregation by inviting Eric and Melia to step forward to be joined in marriage, much to the delight of everyone there. 2000. George Harrison is discharged from Harefield Hospital earlier than expected after making what a hospital spokesman described as “such a good recovery”. He slips out of the hospital late in the evening and is driven home to his estate in Henley by Mercedes. Surgeons said that although his lung had collapsed during the attack at his home on December 30th, the knife had missed any major blood vessels. As a result, the ex-Beatle is expected to make a full recovery within a few weeks. Top Of The Pops (BBC-1, U.K.) Presented by Jimmy Savile. Bo Flyers – Do The Buster, Greg Lake – I Believe In Father Christmas, Pan’s People dancing to Mike Oldfield’s In Dulci Jubilo (Pans People); Billy Howard – King Of The Cops, Slik – Forever And Ever; Abba – Mamma Mia, Glyder – Pick Up And Go; Dana – Its Gonna Be A Cold Cold Christmas; Queen – Bohemian Rhapsody (Promo). Here’s the first part of the whole show, which you should find on around this page. 1953. Hank Williams dies in the back of a car on his way to a gig in West Virginia. Although the death certificate gives the cause of death as a heart attack, it was more probably the result of too much booze and too many pills. Here we are, it’s 2009. Another year gone and a new one just beginning. I hope your New Year, like mine, will be better than last year. I’m tempted to say it can’t be worse! Go to Rockmine‘s main site here. A regular blog is the easiest and quickest way to update what’s happening with memorabilia, so here goes. Following the abandoning of any thoughts of a memorabilia exhibition in Elgin, I’ll be adding items that would have been included in that. The first two items are classic and stunning images from the Jimi Hendrix Exhibition which were sold at a charity auction in 1993. 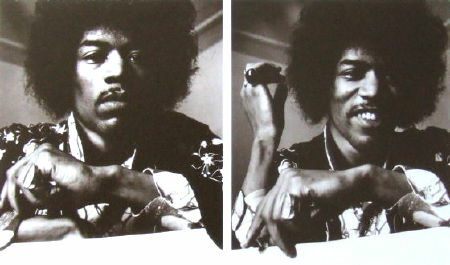 The one seen above is “The Fist” by Jim Marshall and the one below is “Rings” by an unknown photographer. 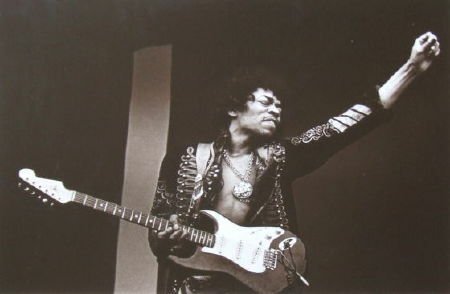 In case you think it odd that I’d planned to include Jimi in an exhibition in Elgin, there is actually a link. Noel Redding, Jimi’s bass player was a regular visitor to the Two Red Shoes as lead guitarist with Neil Landon And The Burnettes. I’ve recently added a new section to Rockmine – Collectable Rock & Pop Books. There, you’ll find a selection of some of the most interesting and most collectable rock books in the world. 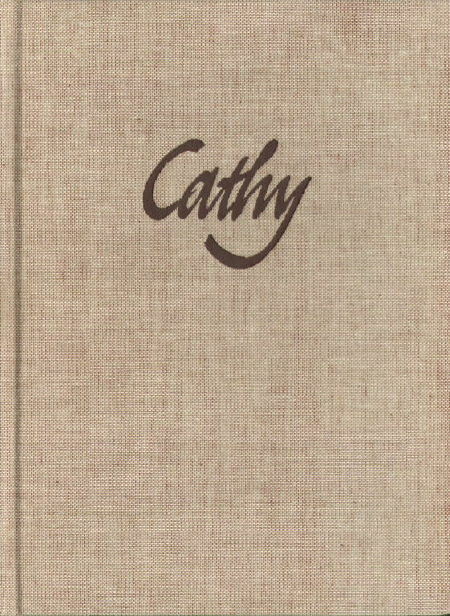 We’ve “Cathy“, the wonderful book of photographs of Kate Bush published privately in 1986; “Konnichiwa“, one of only 32 ever published for George Harrison to give as gifts on his tour of Japan. Two other George Harrison books – “Songs By George Harrison” and “Songs By George Harrison Volume 2“. Neither is numbered or signed, except by Keith West, the illustrator. Volume 2 even comes with both the CD and 7” E.P. 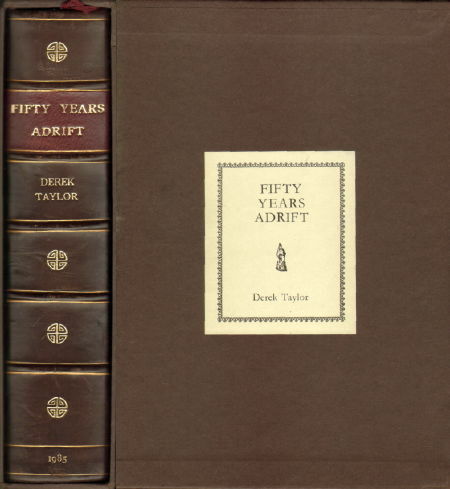 Lastly, for now, Derek Taylor‘s “Fifty Years Adrift“. Many consider this to be the best Beatles related book ever written. It’s lavishly illustrated and packed with memorabilia. Published in a limited edition of 2,000, copies are known to sell for £ 5,000! This clearly states that it isn’t part of the limited edition but a review copy. It’s neither numbered nor signed but is much rarer than those which are. That’s all for now, I’ll list items here as and when I add them to Rockmine.